One minute Peter Ash is on a routine protection job, part of a team sat in the back of an armoured car full of cash; the next minute, all hell breaks loose. Ash is fighting for survival as well as protecting his cargo. The aftermath of Ash’s assignment is as traumatic as the event itself. Ash can no longer trust anyone, not even law enforcement, and the attempts on his life just on keep coming. This isn’t the first time Heavy Metal Protection have had one of their vehicles targeted, but if Ash has his way, it’ll be the last. He’s seen action before in the military, but he is going to need more than just skill – if he’s going to walk away from an enemy that appears always two steps ahead. 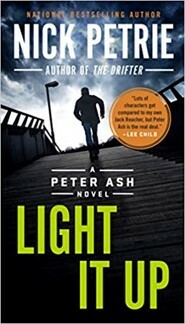 The quote on the cover from Lee Child, eludes that “Peter Ash is the real deal”- setting a high bar, but there won't be many that disagree after reading the remarkable thriller. Ash is a complex character. He’s not one to waste words, but is far more than just a strong, silent hero. We get Ash’s backstory woven subtly into the narrative (for those who haven’t read the previous installments) as well as insights into military trade-craft. Ash’s Post-Traumatic-Stress-Disorder [aka PTSD] which morphs into suffocating claustrophobia; and the long-distance relationship with June Cassidy helps to humanize him, and elevate him above the tough-guy capable of extreme violence, stereotype. In addition, well-crafted dialogue, an intriguing supporting cast, all help make for a fast, compelling thriller that is a welcome addition into a most compelling series.